To investigate changes in the pattern of metamorphopsia in patients after idiopathic macular hole (MH) surgery and the relationship between metamorphopsia, visual acuity (VA), and macular parameters. This prospective, interventional study included 53 eyes of 53 patients with idiopathic full-thickness MH. The severity of metamorphopsia was quantified using M-CHARTs. Minimal and basal diameter of MH and disrupted length of ellipsoid zone were measured using spectral-domain optical coherence tomography. Preoperative mean M-score was significantly improved from 0.95 (0.73–1.60) (expressed as median [25% percentile, 75% percentile]) to 0.5 (0.28–0.63) after surgery (Z = −5.573; P < .001). Postoperative mean M-score was significantly correlated with mean minimal diameter of MH, preoperative mean M-score, and preoperative logMAR best-corrected VA. Multiple regression analysis verified that postoperative mean M-score was significantly correlated with mean minimal diameter of MH (adjusted r2 = 0.113; P = .008). Metamorphopsia and VA were significantly improved after successful MH surgery. Mean minimal diameter of MH is valuable prognostic factor to metamorphopsia after MH surgery. Metamorphopsia is one of the most common symptoms in patients with macular hole (MH), apart from the loss of visual acuity (VA).1,2 Metamorphopsia can be partially alleviated by MH surgery, but the effect of the treatment varies with the individual. The mechanisms of metamorphopsia are not fully understood. Possible factors including radial displacement of photoreceptors, abnormal distribution of outer nuclear layer and inner retinal layers, and inter-retinal cysts within the fluid cuff were mentioned.3,4 It is revealed that macular parameters can be prognostic factors in MH surgery,5 but whether macular parameters can predict metamorphopsia remains unclear. M-CHART (Inami, Tokyo, Japan) has been proven to be a simple and effective method to quantify metamorphopsia.6–10 A previous study reported that the horizontal metamorphopsia score (M-score) was positive correlated with the vertical retinal change, and the vertical M-score was correlated with horizontal retinal change in patients with epiretinal membrane (ERM).11 However, previous study calculated macular parameters using scanning laser ophthalmoscopy, or calculated only the horizontal macular parameters by optical coherence tomography (OCT) in patients with MH. It is necessary to calculate more complete macular parameters to explore better prognostic factor for metamorphopsia after MH surgery. In this study, we investigated the relationship between M-score and macular parameters before and after surgery, both in the horizontal and vertical directions. Fifty-three eyes of 53 patients with idiopathic full-thickness MH (37 female and 16 male; mean age: 61.9 years ± 8.1 years) were recruited from Beijing TongRen Eye Center. The study followed the tenets of the Declaration of Helsinki and was approved by the institutional review board of Beijing Tongren Hospital, Capital Medical University. All subjects signed informed consent forms after the aim of the study was fully explained. The diagnosis was confirmed by using the spectral-domain OCT (SD-OCT) system (Cirrus HD-OCT; Carl Zeiss, Dublin, CA). All patients had gone through 23-gauge pars plana vitrectomy (PPV) + internal limiting membrane peeling without staining + gas injection (C2F6), face-down position was maintained for at least 1 week. Exclusion criteria were concomitant eye diseases that affect best-corrected VA (BCVA) and OCT image (glaucoma, age-related macular degeneration, ERM, spherical equivalent of −6.00 or more diopters) and cataract or vitreoretinal surgery history. The examinations, including BCVA, severity of metamorphopsia by M-CHART, and the macular parameters by B-scan images of SD-OCT. All examinations were performed at 1 week before surgery and at 3 months and 6 months after surgery. M-CHARTs were used to monitor metamorphopsia at different follow-up time points.10 M-CHARTs consist of 19 dotted lines with dot intervals ranging from 0.2° to 2.0° of visual angle with two guiding optotypes. The two-line type were used, as most patients with MH suffered from central scotoma. The straight line projected onto the retina is recognized as a curved or irregular line in the patients with metamorphopsia. If the straight line is replaced with a dotted line and the dot interval is changed from fine to coarse, the distortion of the line decreases with increasing dot interval, until finally the dotted line appears straight. Patients view the M-CHART at a distance of 30 cm through corrective lenses. When the patient recognizes the dotted line on the chart as being straight, its visual angle is considered to be the M-score. In this study, we measured metamorphopsia for horizontal lines and vertical lines to obtain separate scores for horizontal and vertical metamorphopsia. We calculated mean M-score as average of horizontal and vertical M-score. Each M-CHART test was repeated three times for each eye at each examination. All statistical analyses were performed with the SPSS Statistics Software version 22.0 (IBM, Armonk, NY). Data were presented as medians (25% percentiles, 75% percentiles). Wilcoxon signed-rank test was used for the comparisons of pre- and postoperative metamorphopsia and logMAR BCVA. Correlations were analyzed using Spearman's test. Multivariate regression analysis was used to investigate the relationship between metamorphopsia, VA, and macular parameters. A P value less than .05 was considered statistically significant. Clinical characteristics of patients with MH are shown in Table 1. Table 2 summarizes the M-score changes before and after MH surgery. LogMAR BCVA was significantly improved from 1.00 (0.70–1.00) to 0.36 (0.22–0.55) at 3 months (Z = −6.371; P < .001) and 0.32 (0.18–0.60) at 6 months (Z = −6.290; P < .001) after surgery. The mean M-score were significantly increased at 3 months (Z = −5.842; P < .001) and at 6 months (Z = −5.573; P < .001) after surgery. 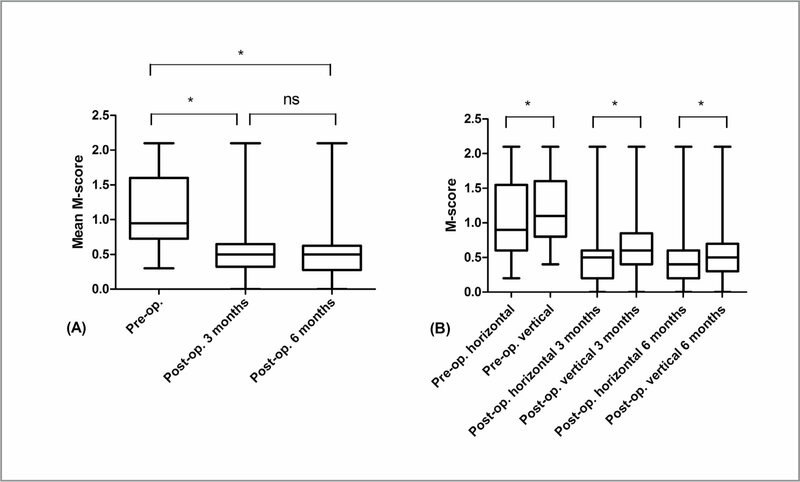 No significant differences were found between the 3-month and 6-month postoperative M-scores (horizontal: P = .954, vertical: P = .131). We also found that vertical M-scores were significantly higher than horizontal M-scores (Z = −2.737, Z = −3.210, and Z = −2.326; P = .006 < .01, P = .001 < .01, and P = .020 < .05, respectively) (Figure 1). In addition, we measured that nasal elongation of the inter-outer plexiform layer was 252.0 (207.0 to 332.5), which was significantly longer than in temporal elongation 222.0 (177.0 to 273.5) (Z = −4.009; P = .001). However, no significant correlation was found between nasal elongation of the inter-outer plexiform layer and vertical M-score (rho = 0.188; P = .178). M-score changes before and after macular hole surgery. 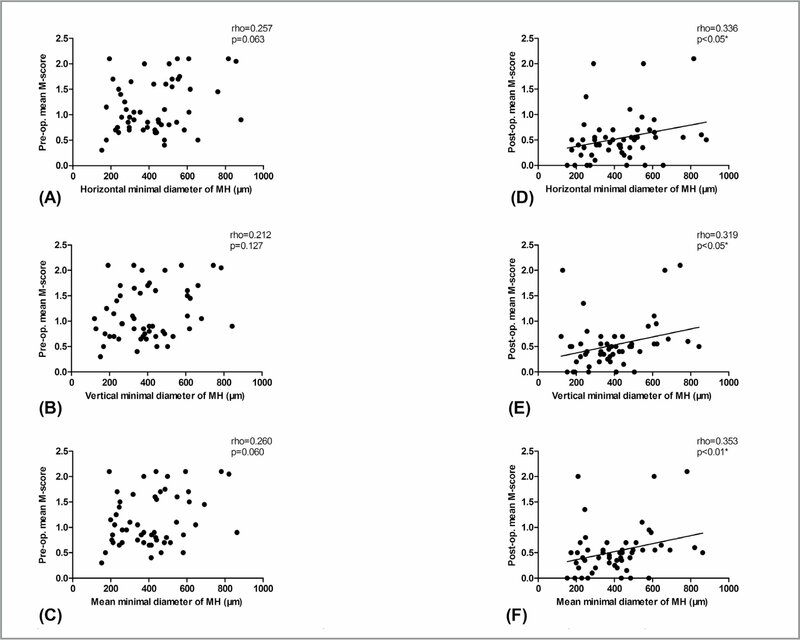 (A) Postoperative mean M-scores were significantly increased from preoperative M-scores at 3 months (Z = −5.842; P < .001) and 6 months (Z = −5.573; P < .001). No significant differences were found between 3-month and 6-month postoperative M-scores. (B) Vertical M-scores were significantly higher than horizontal M-scores(Z = −2.737, −3.210, −2.326, respectively; P = .006 < .01, P = .001 < .01, and P = .020 < .05, respectively). 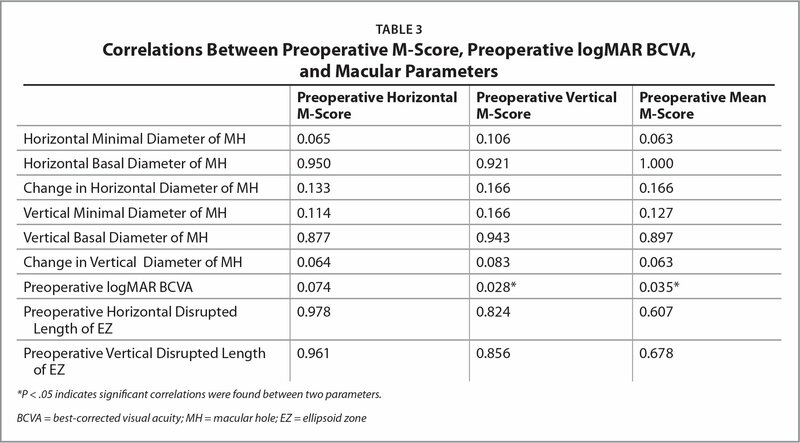 Table 3 summarizes the correlations between preoperative M-score, preoperative logMAR BCVA, and macular parameters. Vertical and mean preoperative M-scores were significantly positively correlated with preoperative logMAR BCVA (vertical rho = 0.303, P = .028 < .05; mean rho = 0.291, P = .035 < .05). No significant correlations were found between preoperative M-score and macular parameters (Figure 2). Correlations between minimal diameter of macular hole (MH) and preoperative/postoperative M-score. (A–C) No significant correlations were found between preoperative M-scores and macular parameters. (D–F) Postoperative mean M-scores were significantly positively correlated with horizontal, vertical, and mean minimal diameter of MH (rho = 0.336, 0.319, 0.353, respectively; P = .014 < .05, P = .020 < .05, and P = .009 < .01, respectively). 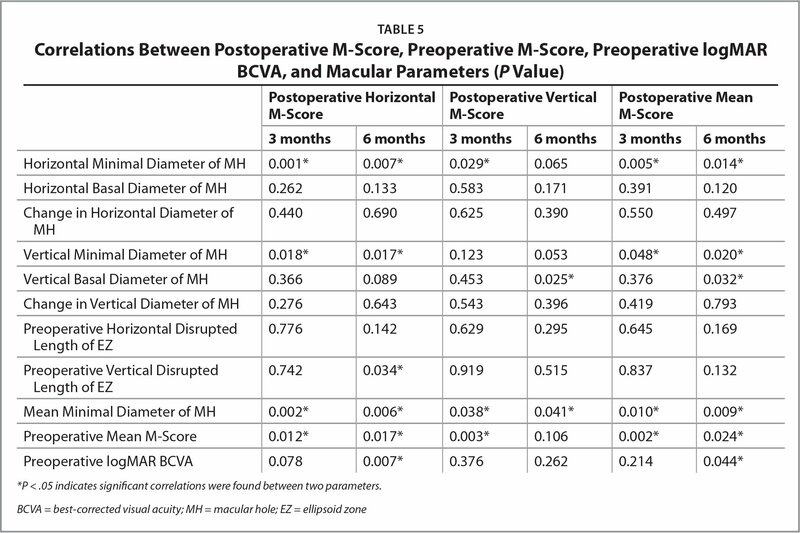 Table 4 summarizes correlations between postoperative M-scores and postoperative logMAR BCVA and macular parameters. Postoperative M-score was positively correlated with postoperative logMAR BCVA at 6 months (rho = 0.352, 0.358, 0.345; P = .010 < .05, P = .009 < .01, and P = .011 < .05, respectively). Postoperative horizontal M-score was positively correlated with postoperative vertical disrupted length of EZ at 6 months (rho = 0.361; P = .010 < .05). Postoperative vertical M-score was positively correlated with postoperative horizontal disrupted length of EZ at 6 months (rho = 0.292; P = .039 < .05). Table 5 summarizes correlations between postoperative M-score and preoperative parameters. Postoperative mean M-scores were significantly positively correlated with mean minimal diameter of MH (rho = 0.353; P = .009 < .01) (Figure 2). Postoperative average M-score was positively correlated with preoperative M-score (rho = 0.310; P = .024 < .05) and preoperative logMAR BCVA at 6 months (rho = 0.278; P = .044 < .05) (Figure 3). Multivariate regression analysis revealed that postoperative mean M-score was significantly correlated with mean minimal diameter of MH (adjusted r2 = 0.113; P = .008 < .01) (Table 6). Correlations between preoperative logMAR best-corrected visual acuity (BCVA) and preoperative/postoperative M-score. Postoperative average M-score was positively correlated with (A) preoperative M-score (rho = 0.310; P = .024 < .05) and (B) preoperative logMAR BCVA at 6 months (rho = 0.278; P = .044 < .05). In our study, the improvement of metamorphopsia and VA in patients with MH were quantified significantly after successful surgery. We also found postoperative M-score was significantly correlated with mean minimal diameter of MH. Metamorphopsia is an important symptom affecting visual quality, which is most believed due to the displacement of the photoreceptors and outer segments from their original. We reported a significant improved of metamorphopsia and BCVA after successful macular hole surgery, which was similar to previous study.6,7,9,10 Although all MHs were closed morphologically, residual metamorphopsia persisted. This may be due to the displacement of the photoreceptor layer and other microfolds in the macular structure. Our study found that the vertical M-score was significantly higher than horizontal M-score. This phenomenon was also found in patients with BRVO-CME.13 Arimura et al. believed that horizontal M-score was correlated with the vertical retinal contraction, and vertical M-score was correlated with the horizontal retinal contraction.11 This phenomenon was also found in our study, since the horizontal M-score was correlated with the vertical disrupted length of EZ and the vertical M-score was correlated with the horizontal disrupted length of EZ after surgery. Sugiura et al. also reported the higher vertical M-score. They speculated the nasal outer segments had a tendency to be thicker than other sides in MH, since the greater stretching of tissues toward the thicker retinal regions. The larger horizontal retinal changes may due to the higher vertical M-score.6–12 To check this, we measured that nasal elongation of the inter-outer plexiform layer was significantly longer than temporal part. However, no significant correlation was found between nasal elongation of the inter-outer plexiform layer and vertical M-score. The reason behind the asymmetrically elongation and the higher vertical M-score remains to be further studied. We found that postoperative M-score was significantly correlated with the mean minimal diameter of MH; however, the result contrasts with Krasnicki et al., who were unable to correlate M-Score with MH dimensions in their 10 cases;9 Zhang et al. considered that postoperative M-score was correlated with both minimal and basal diameter of MH divide macular height;14 Sugiura et al. considered that postoperative M-score was only correlated with horizontal basal diameter of MH, especially in patients with intraretinal cysts.6 There are two studies that referred to the cuff of fluid. In Arimura's study, a ring-shaped band around the MH was defined as the fluid cuff. In Sugiura's study, the area of intraretinal cysts within the fluid cuff was measured by ImageJ software (NIH, Bethesda, MD). In our study, cuff of fluid only showed in 17 eyes, which has less representativeness. In addition, we considered that the area of intraretinal cyst within the fluid cuff may have a difference in different cross-sections. Above all, we did not pay particular attention to the cuff of fluid. Kroyer et al. considered that metamorphopsia has correlations with both minimal and maximal diameter of MH without using the M-CHART.15 Kroyer et al. proposed a possible mechanism that photoreceptor displacement can induce the metamorphopsia in eyes with MH, and anatomic structure of the retina after biomicroscopic closure of the hole has a persistent discontinuity of the photoreceptor outer segment layer.16 The mean minimal diameter of MH reflects the range of serious rearrangement and reconstruction of retinal pigment epithelium cells, which may be related to the residual metamorphopsia after surgery. We speculate that mean minimal diameter of MH may be a better predictive factor for postoperative metamorphopsia. Our study proposes that the mean minimal diameter of MH (the average of the horizontal and vertical minimal diameters of MH) may be a prognostic factor for postoperative metamorphopsia, which may help one to predict postoperative metamorphopsia before surgery. We did not include degree of cystic changes, as few of patients in our study have cystic changes. Larger samples, longer follow-up, and more delicate macular parameters will be needed to prove this hypothesis in the future. Zhang X, Ge LN, Shen LJ. Quantification of metamorphopsia in patients with idiopathic macular hole after successful surgical treatment. Chinese Journal of Ocular Fundus Diseases. 2011;27:350–352. From Beijing Tongren Eye Center, Beijing Tongren Hospital, Capital Medical University; Beijing Ophthalmology and Visual Sciences Key Laboratory, Beijing, China (XDL, YW, MG, YY, ZW, JC, WL); the Department of Ophthalmology, Yantai Yuhuangding Hospital, Affiliated Hospital of Medical College, Qingdao University, Yantai, Shandong, China (LL); and the Department of Ophthalmology, Kailuan General Hospital, Tangshan, China (XXL). XiDa Liang, MD, and Yi Wang, MD, contributed equally to this paper as co-first authors. Address correspondence to Wu Liu, MD, Beijing Tongren Eye Center, Beijing Tongren Hospital, Capital Medical University; Beijing Ophthalmology and Visual Sciences Key Laboratory, No 1., Dongjiaominxiang, Dong Cheng District, Beijing, China 100730; email: wuliubj@sina.com.